In Bernardo Bertolucci’s 1900, fascism proves a galvanizing force — but only for psychopaths. Italy’s budding sadists, Attila Mellanchini (Donald Sutherland) chief among them, gravitate to the power and impunity fascism’s advent seems to promise, and soon enough, Attila and his rabble-roused associates are terrorizing the Italian countryside under a wafer-thin pretense of ideology. Not so in The Conformist, Bertolucci’s boldest and most expressive film: Here, protagonist Marcello Clerici (Jean-Louis Trintignant) recedes into fascism not for the authority he expects it will confer but for the comforts. As it stands, Clerici leads a fraught existence, his thoughts forever consumed by shame and remorse, and in a sense he blames his independence — a state of affairs that permits him too much time, perhaps, to be left alone to his fears. The appeal of fascism, for Clerici, lay in its inflexible uniformity: He hopes to lose himself in a system of thought so rigorously controlled that he needn’t think for himself again. (He’s looking to get married, too, for good measure; he lists his fiancée’s prime virtues as her vacuity and affable nature, the better to mindlessly settle down with.) It’s fascism as the ultimate manifestation of conformity. 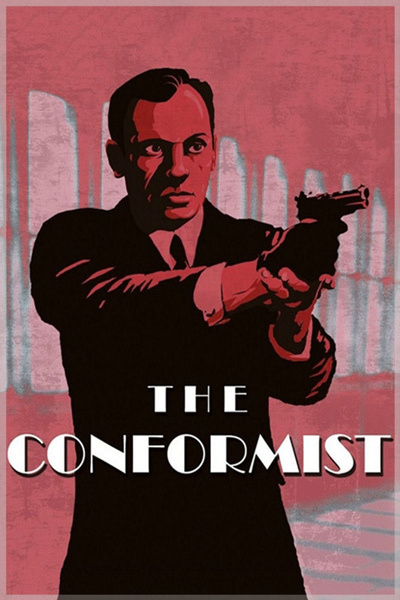 This view — a quasi-satirical thesis of sorts — makes The Conformist a rather more trenchant and acerbic anti-fascist critique than the comparatively crude 1900. Here, those drawn in under the influence of fascism aren’t rendered as caricatures of cruelty. They needn’t be: Their weakness, in Bertolucci’s conception, speaks for itself.